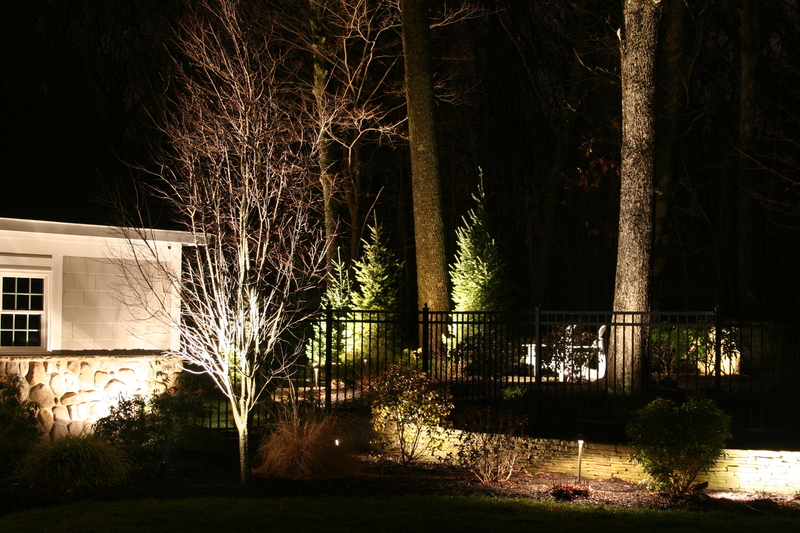 Our lighting approach is coupled with an evaluation of the landscape and many times we add elements, islands, focal plants and trees to create depth in the landscape. 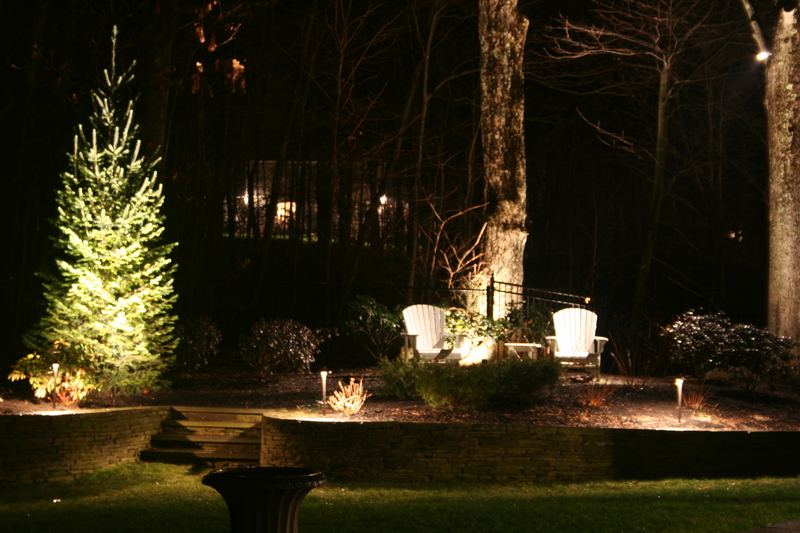 Certain techniques are used to front light, back light and cross light certian focal trees in the landscape. The vistas and point of view need to be determined and understood even if not present at the time of installation. 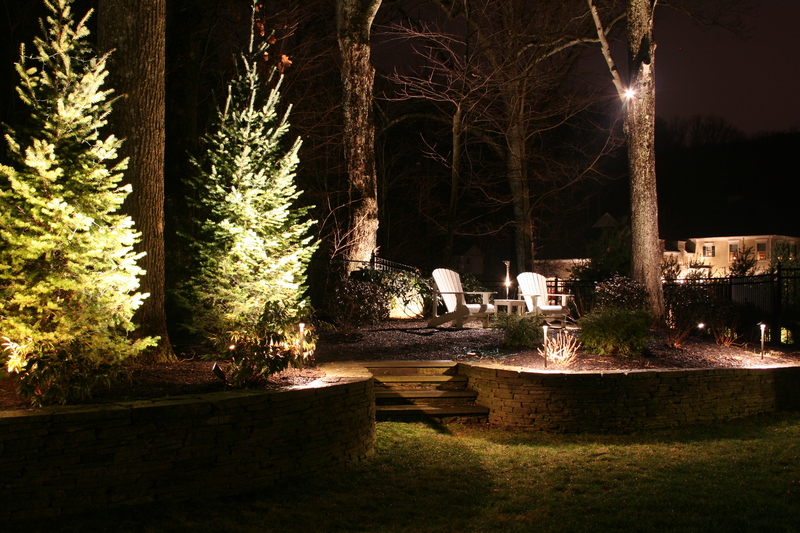 These thoughts and nursery improvements are best handled by a Landscape Nursery professional. One of the advantages we have is that we operate out of a landscape nursery and have horticultural specialists to show the potential lighting customer the importance of these focal trees and specimen plants. Lots of interesting plants are admired during the day and not apparent at night. 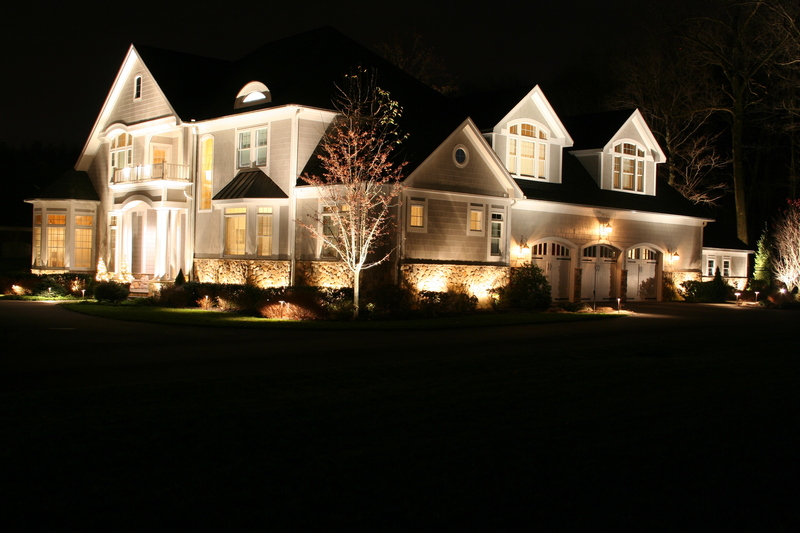 Preferred Properties Lighting process includes eight seasons -both four seasons day and night. Lots of special night time scenes are during snow covered evenings, colorful fall foliage events, spring and summer color blooms. The best designers create night time scenes with no glareback. 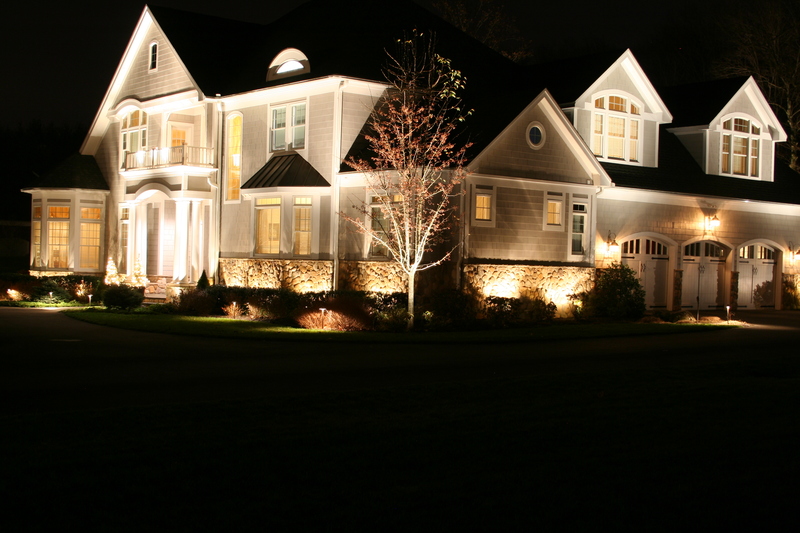 Go to www.nightlightingdesigner.com to see night time scenes with no glareback. 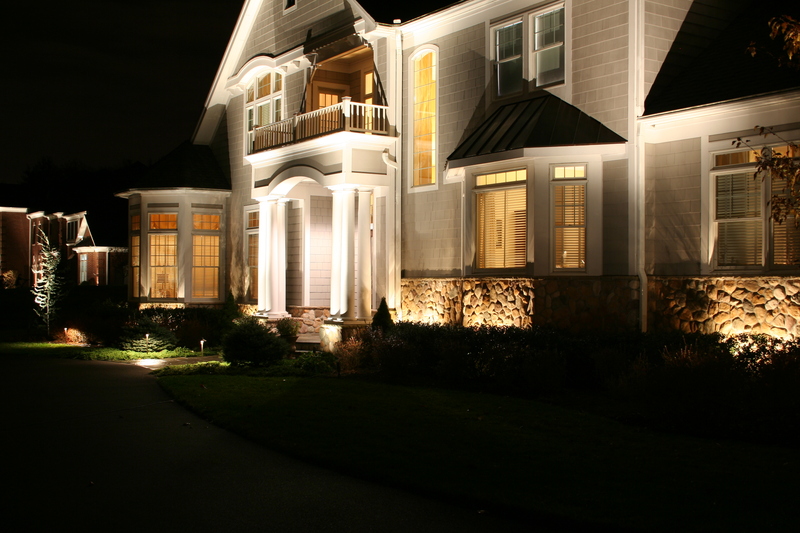 This means incorporating the desired night time scene with the existing post and porch lights. Many times these fixtures have the brightest possible bulb with clear vision of the bulb itself. A true no no. Techniques to fix this is to frost the lens, use frosted bulbs, take out some of the bulbs diminishing the brightness, and probably the most time consuming is to put this fixtures and other line voltage fixtures on dimmers. These efforts make the most sense when trying to perfect the lighting design. 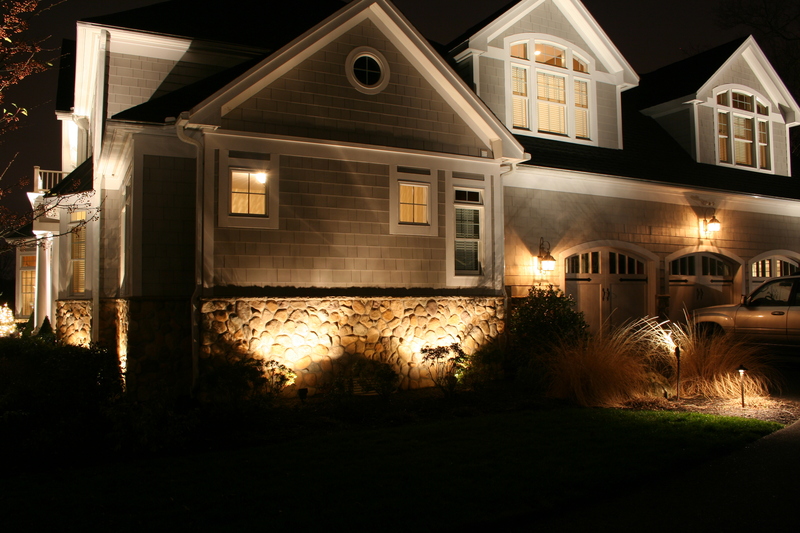 You can see the efforts here by dimming the garage lights to blend in with the landscape lighting. 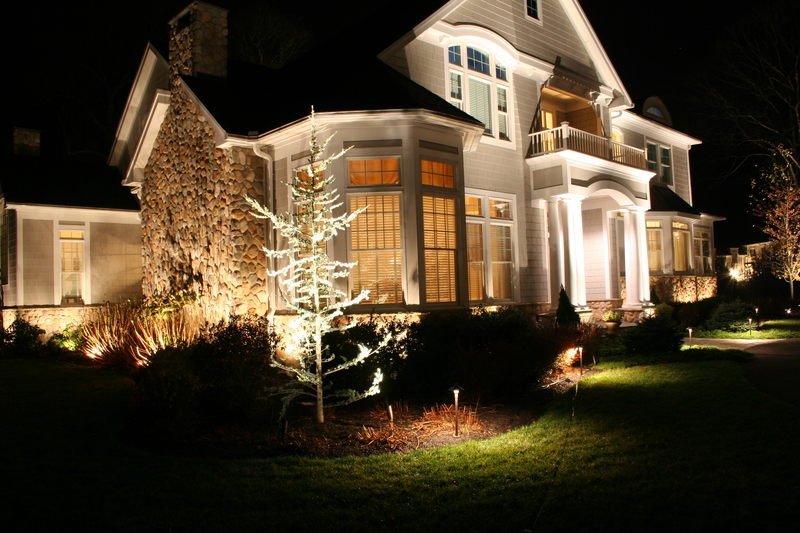 See the cross lighting technique on this Blue Atlas Cedar with stone siding backdrop. The blue ish texture of the Atlas creates interest against the wallstone and Green holly hedging. One of the challenges for the front portico was the ability to get light up on the top peaks with shadowing or leaving a black hole. The ability to hide the wire up the gutter and come out on the top in the upper porch gave us greater flexibility to illuminate the all important area above the front door. This trade secret was taught to me by Unique Lighting specialist Nate Mullen on a job in Delaware. Corrective pruning keeps the plant materials in an ideal scenario for optimal lighting performance. We had to trim back the hydrangea against the stone chimney for best results. Lots of thought and vision goes into each lighting design. Wall techniques such as this strifing seen below makes the wall look well lit in the landscape. Look closely at this incredible scene. The evergreens seem to glisten from all sides. 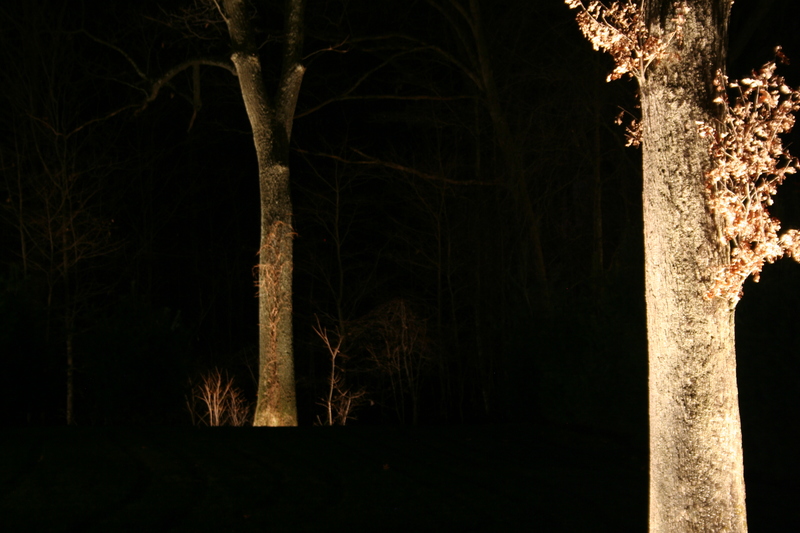 The deciduous trees are lit from the bottom up and moon lighting gives you the romantic feel. One of my favorite looks are the giant Oaks. 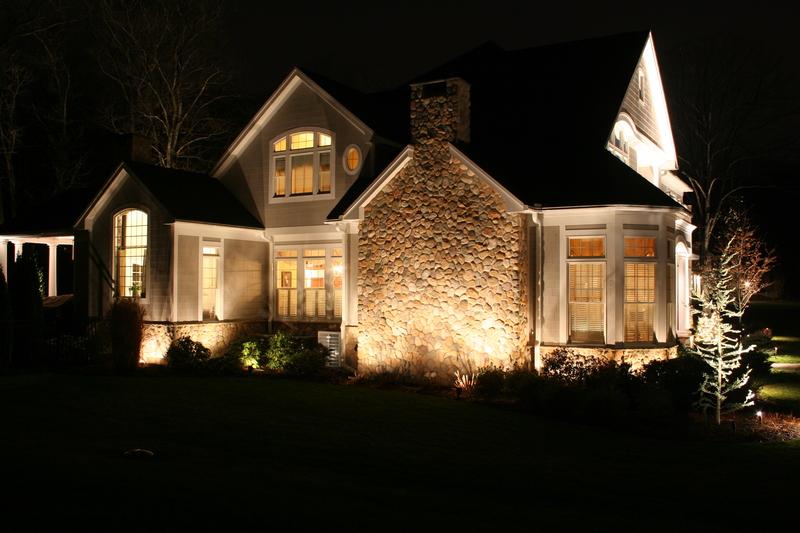 They look so realistic and creates depth and reflectance in the side and back yards. This is truly an amazing night time scene. 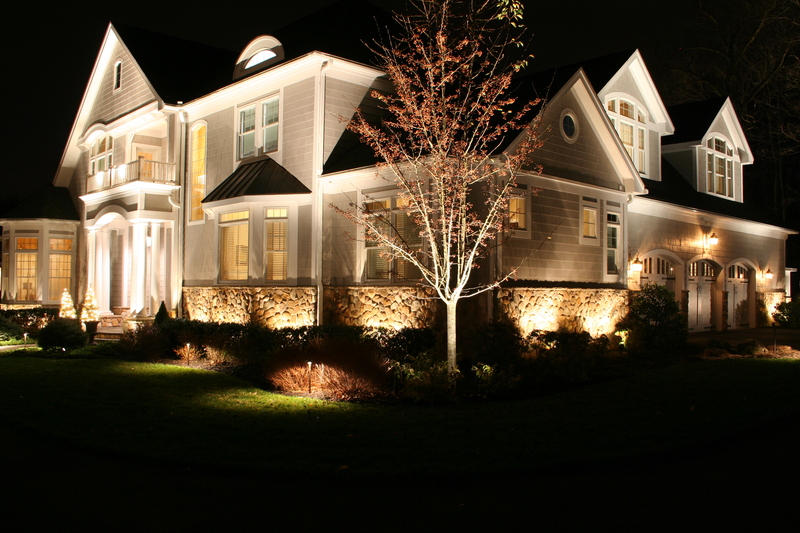 This entry was posted in Featured Projects, landscape lighting design, landscsape lighting, lighting automation, night lighting, outdoor lighting, Outdoor Lighting / Low Voltage Lighting, Uncategorized, Unique Lighting and tagged AOLP, CAST lighting, controlscape, Featured Projects, landscape lighting, landscape lighting automation, landscape lighting design, landscsape lighting, lighting automation, lighting transformers, LITE program, low voltage lghting fixtures, night lighting, night lighting automation, outdoor lighting, Outdoor Lighting / Low Voltage Lighting, outdoor lighting automation, Unique Lighitng, Unique Lighting. Bookmark the permalink.